The Lodge at Big Falls is situated on the banks of the Rio Grande river in Belize’s southern Toledo District. Big Falls Lodge is located on a meander of the river with almost a mile of river frontage. There are views towards the Maya Mountains to the north west while the south eastern bank faces the village of Big Falls. However, there are no “big falls” in Big Falls. This is just the name of the village! At the Lodge there is a full service restaurant and bar and is a licensed tour operator offering a wide range of tours and activities within its packages which include a mix of natural history (birds, butterflies, moths and animals), adventure (kayaking, snorkeling, caving and hiking) and cultural encounters with local people. 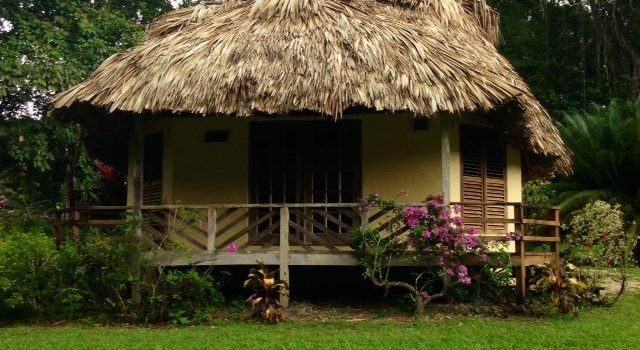 It is the ideal base in the heart of Toledo for your Belize adventure. Six of the rooms are individual cottage style cabanas (sleeping up to four persons) with a full en-suite bathroom and shower providing hot and cold water. These cabanas are thatched with bay-leaf palm, a traditional Belizean thatching material. Beautifully tiled floors, ceiling fans and fully screened, wood louvered windows offer a cool well-ventilated living area. Each cabana has a hardwood floor and ceiling made from a mix of secondary tropical hardwoods including nargusta, santa maria and milady. Each has two queen size beds, ceiling fans, air conditioning, en-suite bathroom and shower, kitchenette with refrigerator, microwave and table-top stove with two burners. • Kitchenette: refrigerator, microwave, double sink, two burner stove, counter & storage space.